Video on The Cut of the items in the final collection - I hadn't noticed the short dress with the feather underskirt (#5), which has a charming deshabille feel to it. Everything is so decadent, particularly at first glance (gold! feathers! gold feathers! ), but when you get a chance to look more closely, it's so clear why Mr. McQueen was a master, doing things with cut and drape rather than piecing. If I have my facts straight, looks 10 and 11 are each from a single piece of cloth. Notice the cape part of #8 - I've been boring people (well, Nick) in IRL for the past few years about how capes are the next thing. I'm not a huge fan of the pinch pleats at the hip on a couple of the skirts (what looks fine on models can look unattractive on a "real" woman). I really can't wait to see these out in the real world. The makeup and hair for displaying the collection is not really flattering but does a good job of putting the focus on the clothes. If you watch the video, you see a model in one of the short dresses (the dress under #8?) with her hair down and a purse over her shoulder; she looks so chic, and suddenly you understand how these clothes could actually work in real life and not just be put directly into a museum. Also in the video you can see the shoes, which are amazing. For the most part I'm an LL Bean boot or flip-flop kind of girl, but I'd hobble around in those in a second! And I love the Union Jack minaudiere. You can find me at kathleendames on Twitter now. No promises that I will post regularly (or scintillatingly), but it seemed wise to stake my claim. Sadly, "purly" was already taken. And the award comes with a questionnaire, which is kind of fun. 1. Where is your cell phone? Hopefully not in the hands of one of the little people. Oh, now I see it - it's on the kitchen island. 2, Your hair? Long, thick, straight, four shades of brown plus grey (all natural, though that probably should change). 3. Your mother? On the trip of a lifetime to Egypt. 4. Your father? On the same trip with Mom. 5. Your favourite food? I can't choose just one! Lobster, I guess. 6. Your dream last night? I sleep so deeply, once I get to sleep, that I almost never remember my dreams. 7. Your favourite drink? Vodka gimlet. 8. Your dream/goal? To raise happy, wonderful kids; be financially comfortable; knit and design for a living. 9. What room are you in? "The" room chez Purly - living/dining/kitchen/study/library. When they renovated this apartment, they took down the walls between the kitchen, dining and living rooms. 11. Your fear? Most of the ... smaller ones (giving up my marriage, home, career, making myself dependent upon others) have come to pass, and I'm still here, so I'll go with a more mundane one: claustrophobia. 12. Where do you want to be in six years? Where I am now but with more financial stability. Although, you know, fame and riches would be OK, too. 13. Where were you last night? Home eating takeout chinese with my sweetie with the kids asleep down the hall - it's a glamourous life, but someone has to lead it. 14. Something that you aren’t? Confrontational. 15. Muffins? Blueberry or cranberry, for preference. 16. Wish list item? A stylish clothing budget and places to wear such items. 17. Where did you grow up? Wilmette, Illinois. 18. Last thing you did? Filled up Penelope's milk sippy. 19. What are you wearing? Jeans, t-shirt, and a hoody sweater (the uniform). 20. Your TV? Useless without the DVR. 21. Your pets? Riley (giant grey short-hair cat with white mittens, socks, and bib). 22. Friends? All over the world. 23. Your life? Very good and totally worth the minor frustrations. 26, Vehicle? Feet, subway/bus, Zipcar. 28. Your favourite store? Yarns in the Farms. 29. Your favourite colour? Blue blue blue! 30. When was the last time you laughed? Two minutes ago when Nick played peekaboo behind me for the kids' amusement. 31. Last time you cried? Ugh, probably last month over some divorce/financial thing. 32. Your best friend? Karen, since seventh grade and forever - I couldn't have survived without her. 33. One place that I go to over and over? Shake Shack. 34. One person who emails me regularly? My dad, though I still remember when he called me at work one day and asked me to send him an email so he could write me back. And now he's sending us pictures with his Blackberry in Egypt! The Luddite has joined the 21st century. 35. Favourite place to eat? Five Islands Lobster Dock. Just had to share this snap I saw yesterday on The Sartorialist's blog. Is that an Einstein Jacket, perhaps? It's nice to see knits appreciated in the wild. There is a lot to like about both of these magazines. For one thing, they're both still publishing! These days every other mag seems to have decided to throw in the towel rather than figure out ways to weather the recession storm. I know it's often better to bow out while you're ahead of the game, but that has left many of us Domino- and Blueprint-less, to name two of my favorite, now-defunct mags. And since many knitters are ... well, I'd rather not use the word hoarders ... let's say "stashers", most of us love having the actual printed magazines in our hot little hands or tucked away for safekeeping and future use. I know there have been plenty of patterns that I've flipped right by only to come back to later with a passion thanks to seeing purty FOs on Ravelry and "the blogs" or just to a change in personal style. 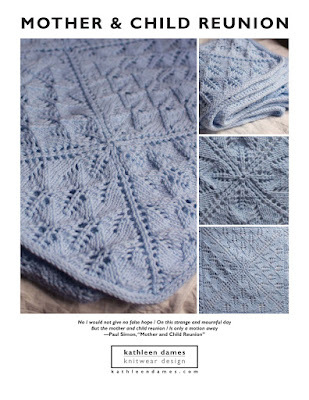 Or a technique that you get interested in as you become a more proficient knitter -- for me it's lace, which I was intimidated by when I first started knitting and buying knitting magazines, but now I want to know everything! For another thing they are both making efforts to have useful online presences, offering patterns for sale online*** [Interweave Knits Pattern Store / Vogue Knitting Pattern Store], making sure pattern previews make it to Ravelry [Interweave Knits / Vogue Knitting] and/or Facebook [Vogue Knitting - doing a great job of getting their FB fans involved with sneak peeks, polls, relevant news items, etc. ], and offering added value online: VK360 is a cool tool that allows you to examine the knitted projects from all angles, though I, personally, could do without the music, but I'm a web curmudgeon, preferring words and images to video and audio. And Knitting Daily from IK is busy with forums, blogs, and the Knitting Daily Galleries showing different IK staffers wearing the same garment and getting their feedback, so you can get an idea of what a project might look like on your body type. But I feel that for all their plusses -- and let's not forget about Clara Parkes's reviews, Meg Swansen's articles from the EZ "vaults", contributions from TechKnitter, BrooklynTweed, and many more, collaborations with Project Runway participants (though not always my style), ANTM models, etc. -- both magazines don't always keep up with the times, style-wise. I find IK's styling a little on the crunchy-no-makeup side. Yet they're the ones who published the Cocktail Capelet (six to eight skeins of $18/skein pure cashmere?!). While VK's models seem overly-made-up to me, the stories are often shot in spaces with lots of stuff, and the models have lots of clothes and jewelry adding to the visual "noise", so it's difficult to tell necessarily if you want to knit the pattern. Yet when they departed from that for the cover story in the last winter issue with the model in front of some grey photographer's paper, it kind of got weird. And there are issues with VK's sizing standards -- some garments are only offered in one or two sizes. Oddly, IK's aforementioned Cocktail Capelet came in three sizes. I guess I just feel like there isn't really a knitting magazine out there for me. Even though I wear jeans and a t-shirt/sweater most every day, I follow the collections, watch the "stylish" reality shows (OK, I watched Jersey Shore, too, but Project Runway wasn't on), and had a favorite supermodel back when there were only a handful of them (Christy Turlington, if you must know) rather than the hordes of them running around today with such titles -- there I go being curmudgeonly again. And, yes, I am a medium, so sizing usually isn't an issue. Funnily, I saw some comments on FB about the new VK issue that the scarves were craziness given that this is the Spring/Summer issue. Ladies complained about hot flashes making such items unnecessary. Yet, you would be hard-pressed to walk around NYC, even on the hottest day of the year, and not see pretty young things with scarves wrapped around their necks like the pretty young things in the Neck and Next story. But the styling on that story did not work for me, though at least the backgrounds were less distracting so I could focus on the knitted projects. As knitters I think we sometimes forget about style when faced with a gorgeous yarn (beautiful in the skein doesn't always make for a pretty knitted fabric) or cool technique (entrelac, I'm looking at you). Knitters sometimes complain about or look sheepish when knitting stockinette, but my favorite sweaters are often the simplest (OK, that is my style -- see jeans and t-shirt, above). Just because you can do a triple-flip (cables! and lace! in variegated yarn! ), doesn't mean you always should. A little design note from the unemployed art director: I do not like that IK moved the patterns to the back of the book, separating them from their "big" pictures, but I do like their new page at the very back with small pictures of all the projects in the issue -- something I think every knitwear publication should do somewhere. VK has always had their patterns at the back of the book without any images, so that's their thing, even if I prefer otherwise, but the problem for me is the numbering system, which is not so memorable, especially when they don't include thumbnail images of projects with the patterns. Things can get confusing: you could start the instructions for #12 and then accidentally turn two pages and find yourself knitting project #23. And I wish they would publish their charts in the magazine. I know that may add two pages to the book and it's difficult to fit everything and have enough ad pages to support your editorial content, but what if I've taken my magazine, yarn, needles, and stitch markers on vacation to get away from it all, only to discover that I can't do more than cast on because the charts have to be downloaded, but it's Sunday and the nearest computer is at the island library an hour away on foot and only open Fridays from 9-noon anyway. So much for that vacation knitting! Yes, we should all check our patterns for everything before we head off, but still. Maybe I'll start posting more "style" research as I come across it, not just highlighting knits in the collections, but applying new styles from the collections (those I like, anyway) to knitting. What do you think? Are you happy with the two big knitting magazines? Is there another "book" I don't know about? Are you a pattern follower, an adventurous knitter, someone who just likes yarn, or ??? **Knit.1's last published issue was Spring/Summer 2009. ***There has been controversy over VK taking pattern sales online, and I'd love to know if things have changed for the better. Anyone?